Born March 2, 1822 near Pittsburgh, PA. Self-taught artist, studied in Cincinnati, OH, New York City and in Italy. Sonntag is best remembered for his romantic depictions of American wilderness and his visionary interpretations of Italian ruins. By the 1850s, he had a studio in Cincinnati and had already sold several of his paintings to the Western Art-Union. In the Cincinnati area, he frequenty made painting excursions with the African-American painter Robert Duncanson. In 1852, he was commissioned to paint a series of scenery of the Allegheny mountains for the Baltimore and Ohio Railroad Company. Sonntag moved to New York City around 1857, where he would live until his death in 1900. Thoughout the 1860s, he painted images of the Allegheny, Shenandoah and Adirondack Mountains. 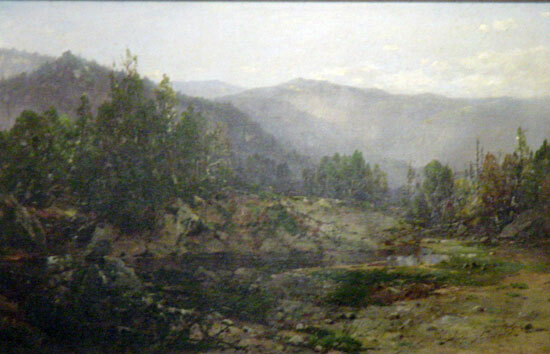 He also painted extensively in the White Mountains. Member: Artists’ Fund Society; Associate Member of the National Academy of Design in 1860; full member in 1861; Academician in 1862. In the collection of: National Academy of Design; Henry Francis Du Pont Winterthur Museum, Delaware; Birmingham Museum of Art; Carnegie Institute; David David, Inc., PA; Good & Hutchinson & Associates, MA; Dartmouth College; Cincinnati Museum; Detroit Museum; Corcoran Gallery of Art; Peabody Institute; Kansas City Museum and the Museum of Melbourne. Died January 22, 1900 in New York City.